The explosion occurred early on the morning of November 20, 1968. Flames and smoke shot out through the mine's Lewellyn and Mod's Run portals. Twenty-one miners were rescued but many others were trapped. 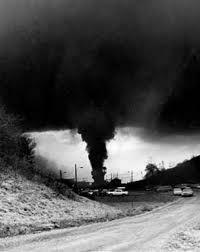 The evening of the explosion, William Poundstone, a Consol vice president, said rescue efforts couldn't be mounted right away because of the fire. "We expect no major developments during the night simply because we must wait until the flames die down. Our best estimate is that at least 70 miners are still trapped inside the mine. We do have on hand the best and most skilled mine rescue teams that are available in the country. They are standing by. But we feel that at this time we cannot send them in to commence rescue operations because of the fire." Seventy-eight miners were trapped in the mine after the initial explosion. After several more explosions and increasing smoke and flames, it became more evident that rescue crews would have to wait. My own personal concern has been to try to work with the federal bureau and the state people to make the proper moves to get this fire under control and get ourselves in a position so we can send rescue men in to rescue these miners. I know that the mine workers' organization is at work in this regard," said Poundstone. After a few days, two rescue teams entered the mine. But, after about four hours of searching, they encountered enough methane to blow the mine again so they were ordered out. Officials finally came to the difficult conclusion that the 78 trapped miners were dead and decided the mine should be sealed so the fire could be put out. The existence of today's Federal Mine Safety and Health Administration is due, in large part, to the Farmington mine disaster.